Mega•Crafty: Baby Shower Planning: The Beginning! Baby Shower Planning: The Beginning! My mom and I started tossing around dates and a few ideas for a shower. I've been to showers where the mother-to-be wasn't actually there because she was otherwise engaged... busy having the baby. And since both my sister and I were born a few weeks early we decided to be safe and make the shower a good month before my sister's due date- we went with October 3rd. Next were the huge decisions about where to have it and what sort of theme to have. My sister was no help here- she didn't have any sort of "vision" for the event. The only thing she said was that she didn't want it to be a ladies only shower- she wanted kids and guys to be there too. Sort of a family type of event. So I went a little out of the traditional and booked a carousel for the event. It's a really gorgeous historic merry-go-round and I think it will be very unique for a shower. 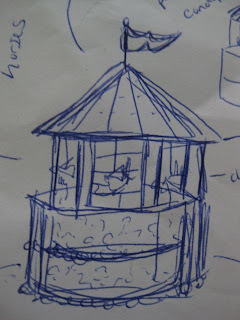 I'm not sure how much you'll be able to see from this sketch but I'm going to make a carousel cake. Now here's the thing... I've never in my life made a cake like this before. The only cake I've ever made is a typical frosted no decoration cake. I showed my husband the sketch and he actually laughed out loud, shook his head and said that I never did anything small. But I don't think it will be that bad (don't quote me on that) since I have a plan to base the entire thing off of a 2 layer round cake which I'm pretty comfortable with. I sense some test cakes in my future (and yours if you're a regular reader). I just have tentative plans right now but I'm also thinking of having a kids table, where there will be coloring sheets or maybe an easy "make and take" activity to help keep them busy between carousel rides. Ooooh... baby showers are so much fun! I can't wait to follow your cake journey! And I think a kids activity/craft table is an EXCELLENT idea, by the way. I'm really excited about the shower plans! I can't wait to start making practice cakes and blogging about all the preparations.